Inquiring minds want to know, well, which is it? Is Shenzhen not reforming fast enough to avoid extinction or is the Shenzhen Model stable enough to become the world’s 11th largest urban economy over the next 13 years? I asked several friends to read the cover page and tell me what it meant, but none seemed interested. Indeed, they laughed and said, “The cover is just propaganda.” Another reminded me that government talk was so far away from the people, it had nothing to do with his life. Another opened to the sports section, where we learned that the Chinese National Marathon team was forced to raise chickens (A27) because they didn’t trust local chickens. Indeed, just announced today, this particular bit of news is burning up the web and weibo as folks wonder “If store bought chicken isn’t safe for the marathon team to eat, is it safe for us?” Others are playing with the pun on “raising chicken” which is “to support a prostitute” (马拉松对养鸡，误会不代表误读 — hee!). Fresh meat, notwithstanding, to understand the Jing Bao front page, we have to keep our eyes simultaneously on Bejing and Shenzhen. In other words, the question of contextualization is why this talk, now? As China’s leaders jostle for the top-ranked positions, supporters are adopting a new language. The latest, from yesterday’s People’s Daily (人民日报) is “We’d rather have less than perfect Reform than the risk of not reforming (宁要不完美的改革，不要不改革的危机)”. And that statement of the next administration’s position on the pace, scale, and content of Chinese development is Shenzhen’s chance to reassert its importance to the nation, even if its necessary to declare Shenzhen’s need to reform as if the SEZ weren’t the flagship for reform — hee, again! So what’s the Shenzhen link to reform? It just so happens that 2012 is the 20th anniversary of Deng Xiaoping’s 1992 Southern Tour, enabling the Municipality to host a conference on the Twentieth Anniversary of the Southern Talk and 10 Great Ideas from Shenzhen (“南方谈话20周年与深圳十大观念专题论坛” 08－09). If we take the time to hunt down the ten ideas, rather than just read the quotes about how great Shenzhen is, we discover that these ten ideas were actually produced by Shenzhen Commercial News (深圳商报) as part of the 30th anniversary celebrations in 2010, when Commercial News organized online voting for the ideas that had not only shaped Shenzhen, but also reshaped the country (深圳最具影响力十大观念评选结果揭晓). What’s more, a cursory review of the top ten reveals that with the exception of two slogans, these ideas were in fact slogans put forward by the Municipal government in the recent past. So what is the Shenzhen Model du jour? It is neoliberal urbanism. Time is money, efficiency is life (时间就是金钱，效率就是生命), May the city be respected for passionately loving to read (让城市因热爱读书而受人尊重), Empty talk harms the country, hard work vitalizes the group (空谈误国，实干兴邦), Give someone a rose and your hands remain fragrant (送人玫瑰，手有余香), Shenzhen, not separate from the world (深圳，与世界没有距离), Reform and innovation are Shenzhen’s root, Shenzhen’s soul ( 改革创新是深圳的根，深圳的魂), Dare to be first (敢为天下先), Realize citizens’ cultural rights (实现市民文化权利), Encourage creativity, tolerate failure (鼓励创新，宽容失败), If you came, you’re a Shenzhener (来了就是深圳人). 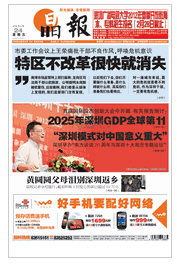 All this to say, the real news content of the Jing Bao front page is the extent to which the Shenzhen Model will represent the civilizing face of reform for Xi Jinping’s administration, begging the question if Xi Jinping is going to talk the reform talk, is China going to walk the Shenzhen walk? And if so, will all this posturing thrust the Municipality into the position of the world’s 11th largest urban economy by 2025? This entry was posted in noted and tagged 1992 southern tour, history, musing, news reportage, reform and opening, shenzhen, shenzhen model, special zone, translation, urban economy. Bookmark the permalink.